A colourful cottage garden classic. A cottage garden classic with ruffled, double flowers and a range of colours for greater garden impact! The tall spires of tightly ruffled, frilled flowers will give height and impact as well as a nostalgic touch. This specially selected hollyhock mix features a range of long lasting, vividly coloured blooms that will bring masses of flowers throughout summer. Extremely easy to grow and super-tough, Hollyhocks are very hardy and perennial, provding you with years of glorious colour. Supplied as a collection of 20 mixed colour Garden Ready Plants for you to plant out or pot up and grow on. Every chocolate box photograph of a traditional cottage has Hollyhocks in it, and this series has the even more double flowers for greater impact! 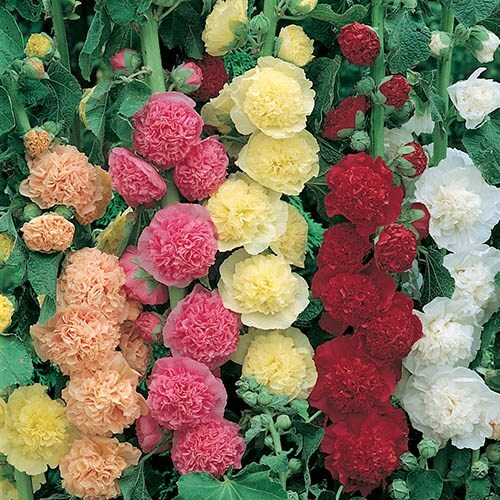 Tall spires of tightly ruffled, frilled flowers which are long-lasting as they open from bottom to top, give height and impact as well as a nostalgic touch, and this specially selected hollyhock mix features a range of vivid colours that will bring masses of flowers throughout summer. Extremely easy to grow and super-tough, Hollyhocks are very hardy and perennial, providing you with years of glorious colour.